Site to verify cross names and search for if a cross has been named. A GREAT place with a bunch of information on orchids species around the world! Literally one of the best reference sites you'll ever find! This site has nearly all you would need to know about orchids! Visit it today! Contact Foxpoint Farms by visiting the above site for more information. Large greenhouses that are full of the Best Orchids! The above is a link to a friends home page that you will find a lot of good information. You will find very good weather related subjects here as well! Learn more about the hardy terrestrials of the Netherlands! this is a place to look as well! For the best Aerial Films and Photographic products in the industry look here! You can learn more about the field of Aerial Photography and Mapping! Check out our new camera! Of course it’s a Kodak Digital! Tropic 1 is another large grower that ships throughout the US. Fender’s Flora on the web is worth a visit. Lots of really nice orchids. A place I just got some nice plants from. This is a site worth a look! Full of a bunch of information about orchids and where to find them and what to do. Green Thumb Flasking Service, Inc.
having flasking done and getting them! A Yahoo page by my son. 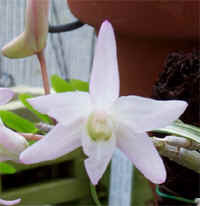 We are also discoverorchids on Yahoo!